If you would like to request a graphic, please visit the !requests post. Visit heartshown to see the layout in action! Sorry for the lack of updates; was busy with my deviantart account and moving Visual Pollution over to a WordPress powered management system! Who it is, What you want, Give me the image links. 1.) From now on, I will only make LJ layouts if you're willing to let me post it for everyone to download! I'm tired of spending a lot of time coding and designing a layout when it's only for one person (unless you pay me! lol). 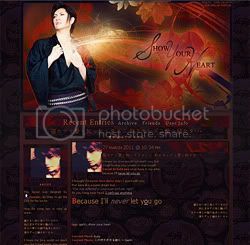 Then, if you're willing to that, request your LJ layout. 2.) I will not use someone's artwork or graphic in a winamp skin etc. without their permission, so be sure to ask first if it's not your work. Visit 2woloves to see the layout in action!